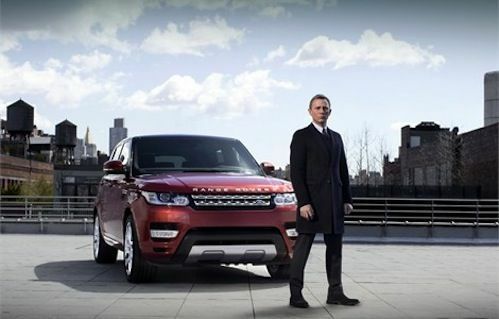 Last night, Daniel Craig revealed the all-new 2014 Range Rover Sport in New York as Manhattan comes to a standstill. In a first-ever live reveal in New York, actor Daniel Craig drove the much-anticipated all-new 2014 Range Rover Sport through the streets of Manhattan. The streets were closed down and Manhattan came to a standstill for the new Range Rover Sport in a scene that was reminiscent of a Hollywood movie. On the eve of the New York Auto Show, Land Rover chose the live drive through New York for the reveal because it’s Range Rover Sport's biggest metropolitan market and the U.S. its best-selling country around the globe. We knew last week that a famous British actor would drive the new Range Rover Sport in the live drive, and we speculated it might be a James Bond actor. Daniel Craig who starred in the latest Bond movie, SKYFALL, drove the new Range Rover Sport and delivered the new SUV for its first unveiling to the world. The new Range Rover Sport was revealed with a new exterior design. Land Rover design director Gerry McGovern said late last year that the second-generation Sport will have a new look and “would be given more personality than before” and it would be “separated a bit more” from the standard Range Rover. The new Sport looks like the new Range Rover Evoque that has been wildly popular around the globe. Land Rover says the 2014 Sport is now positioned clearly between the Range Rover and the Evoque “through a clear, shared design DNA. The new 2014 Sport gets shorter overhangs at the front and rear, plus additional width (+55mm) give the new SUV a contemporary stance. It is eight percent more aerodynamic than the outgoing vehicle (Cd 0.34). The new Sport is 149mm shorter and 55mm lower than the all-new Range Rover on which it is based and model-for-model weighs 45kg less. It also features a “faster” windscreen angle, streamlined and rounded profile and lower, dynamic sloping roofline. Craig drove the new SUV through closed off streets in Manhattan, and delivered the all-new Range Rover Sport to a packed crowd of guests. Included on the list were Michael Strahan (former American football player and TV Presenter), Yasmin Le Bon (Model), Zara Phillips MBE and Jade Jagger (Designer) at Skylight at Moynihan Station on 8th Avenue where the vehicle was officially revealed for the first time. Craigs drive was broadcast live as a global reveal and was filmed as part of a short film titled “The Delivery”. The film was directed by action film 2nd unit director Jonathan P B Taylor, lauded for his work on Fast & Furious, Spiderman, Captain America and more recently Die Hard. Daniel Craig stars in the film and is tasked with delivering a top secret package. It starts at the Land Rover manufacturing plant in Solihull, UK, where the new Sport is shipped under the cover of darkness in a large container over to Manhattan. The all-new Range Rover Sport is unveiled and driven through the streets of New York, over Manhattan Bridge and through a closed off tunnel. Craig needs to get it to the launch venue on time. Now that Daniel Craig has revealed the all-new 2014 Range Rover Sport to the world, Look for the newly-designed SUV to go on sale here in the U.S. and around the globe at the end of the year.